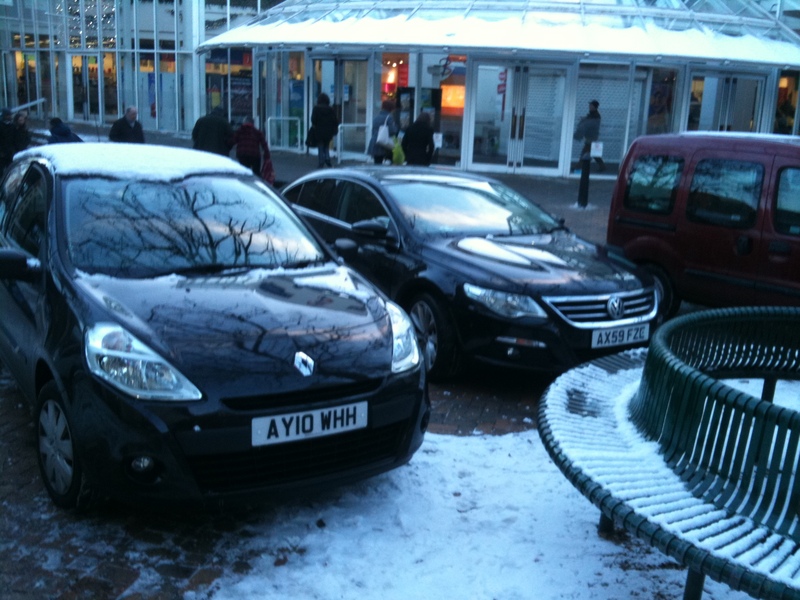 I spoke to one of the managers at the Ipswich branch of BHS today about their parking in Arras Square. He explained that they had discussed the issue with head office who said that it was fine for them to continue to park in the square which they intend to do. They are legally allowed to do so because they own the area immediately outside the store where they park. Indeed they complain if anyone else parks there. As such we can see plenty more of this. Neat parking by a BHS manager! Both managers block the seating today! 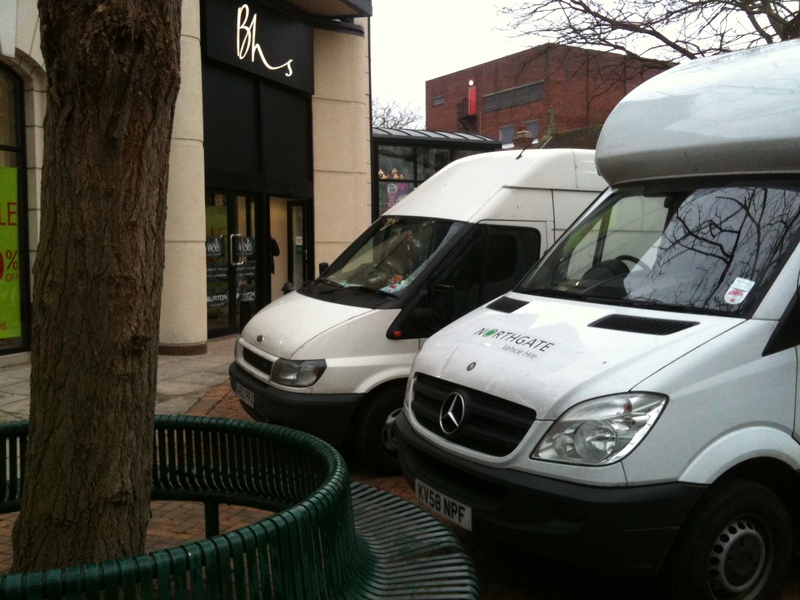 Clearly BHS have not used their van for some time! I discovered recently that BHS is owned by a certain Philip Green, the 9th richest person in the UK who is unfortunately pretty good at avoiding paying UK tax, £300m by one estimate. This makes it strange that the government has recently appointed him to oversee the goverment’s spending cuts. This may be why some of Philip Greens’s other shops, including TopShop, have recently been targeted by Uncut who argue that if corporations paid tax properly then the need for cuts would be greatly reduced. Philip Green says the accusations are ‘outrageous’. Since her 9 year old son was hit in the face by a car door opened by a driver who had parked on the pavement, a mother in Manchester has taken to blocking the road to her child’s primary school explaining that: ‘If you block the pavements then I’ll block the road’. The headteacher of St Wilfrid’s School said: “The majority of them are very supportive but it’s a shame there is a minority of parents who keep double parking and using the pavements.” Again, we hear that it is a minority of drivers who cause these issues, and it is yet another example of a child being injured by this dangerous but generally accepted behaviour. 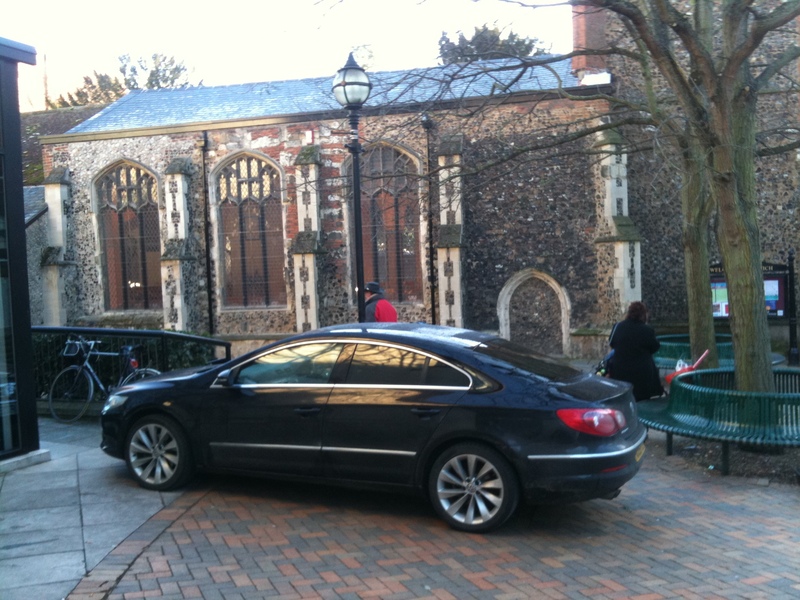 good on you, its a nightmare when cars park on the kerbs all around schools and also dangerous!!! why dont people just walk to the school to pick up their kids!! Nice one. Sick to death of motorists, you can’t move in this country without a vehicle up your backside, reversing at speed without looking, opening car doors without looking, speeding around bends the list goes on. Good on ya girl, you have the support of all non-selfish people and drivers. Well done girl! Keep up your protest. Finally, this longer response which is so typical of what happens if one challenged the behaviour. 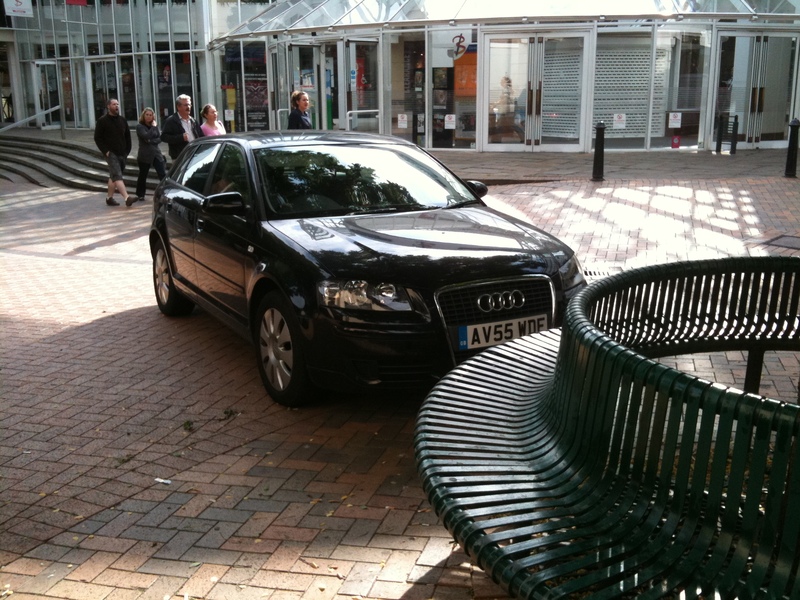 “I saw a woman parked on yellow zig zags outside a school in Cheadle last week. She was putting her child inside the car, not giving a monkeys for the safety of anybody elses kids. 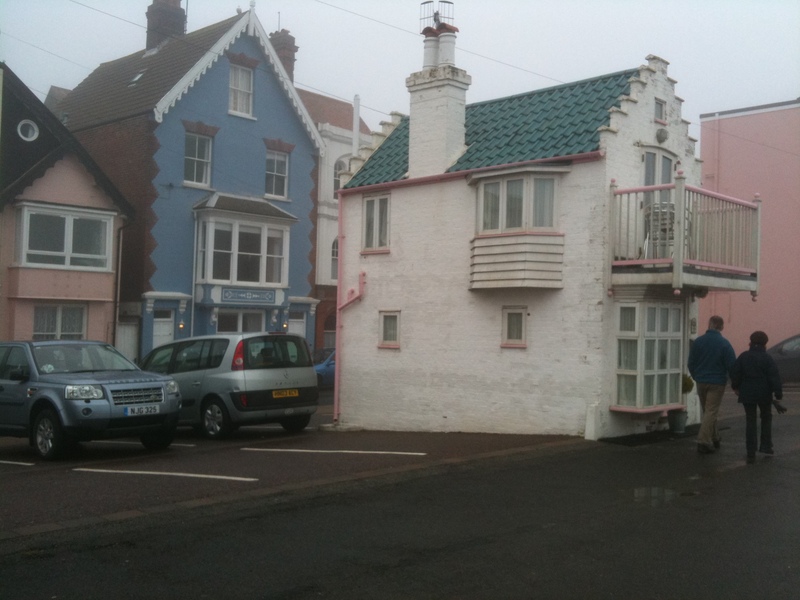 I said you ‘You cannot park there’. ‘I know, sorry’ she said. ‘Well move it then’ said I. ‘Who do you think you are speaking to’ she asked angrily. She has a problem with the way people to speak to her, but does not give a damn for the safety of other peoples children. 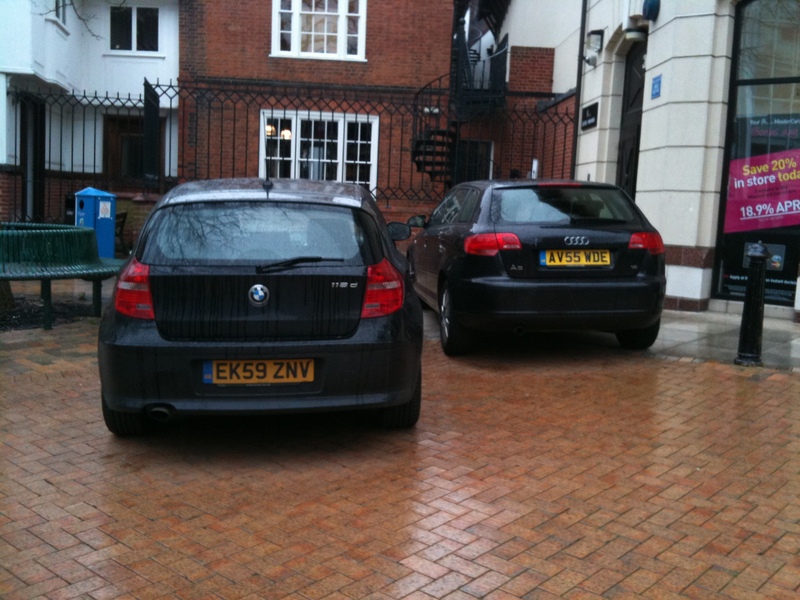 In London where pavement parking is theoretically illegal everywhere unless allowed the councils seem to be trying to regularise parking arrangements, either by enforcing the ban on exiting ban on pavement parking or by allowing parking through legislation and white dotted lines along the pavement. I was pleased to see that when Houslow recently consulted on allowing parking officially on Gould Road that they made it a requirement that 1.5 meters should be retained for pedestrians. 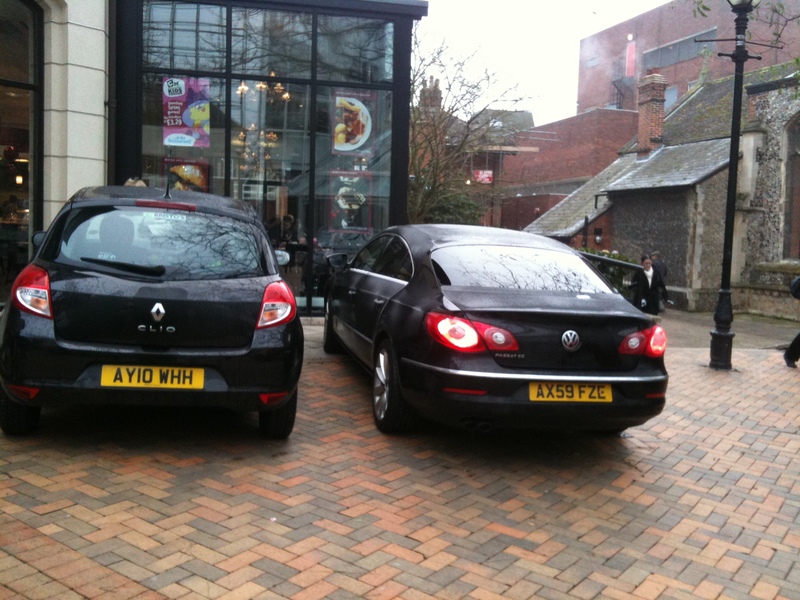 Bays have been created in other places with considerably smaller space left for pedestrians. I was trying to find an example, in Waltham Forest I seem to remember, where there was only 700mm left of pedestrians which is less than the width of a doorway! I will update this post if someone can give me a link to the post. Incidentally, according to the current law as it applies in most of the country outside London a car is only causing an ‘obstruction’ if someone is actually being obstructed. 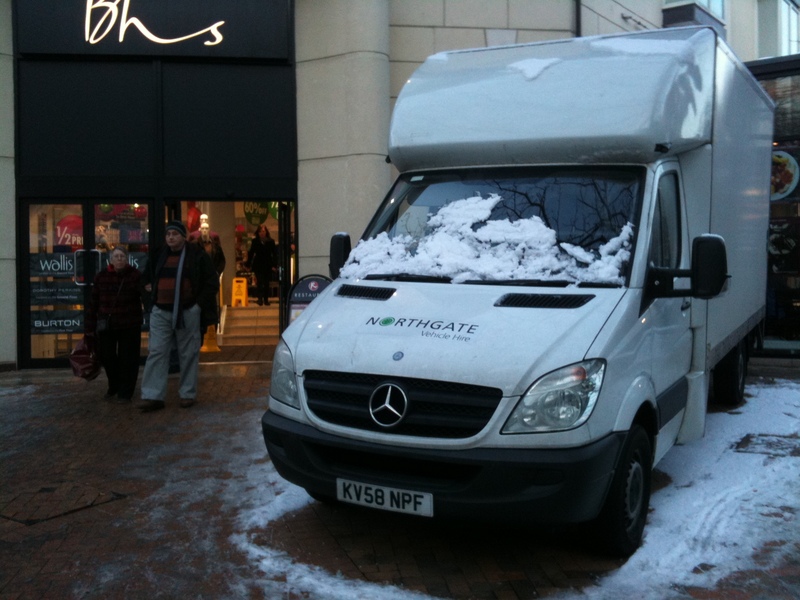 And then even if it is impossible for that person to get past on the pavement the police may determine that they can simply use the carriageway instead as was the case in Bristol in this example which the police said was ‘not obstructing the highway’! Be un-prepared and then do nothing! As a boy scout I was encouraged to ‘be prepared’ and then act if appropriate. 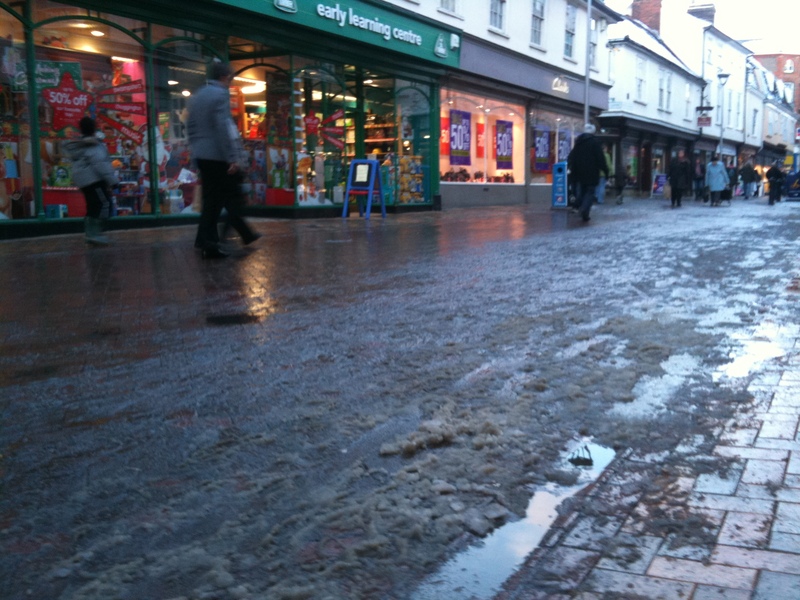 While in town today I discovered that the shopkeepers weren’t prepared for the snow and then didn’t respond. They were inside staying warm while their customers were fighting there way through the snow and slush outside. These modern shop-keepers seem to expect the ‘authorities’ to do it for them and if the authorities don’t then it doesn’t get done. 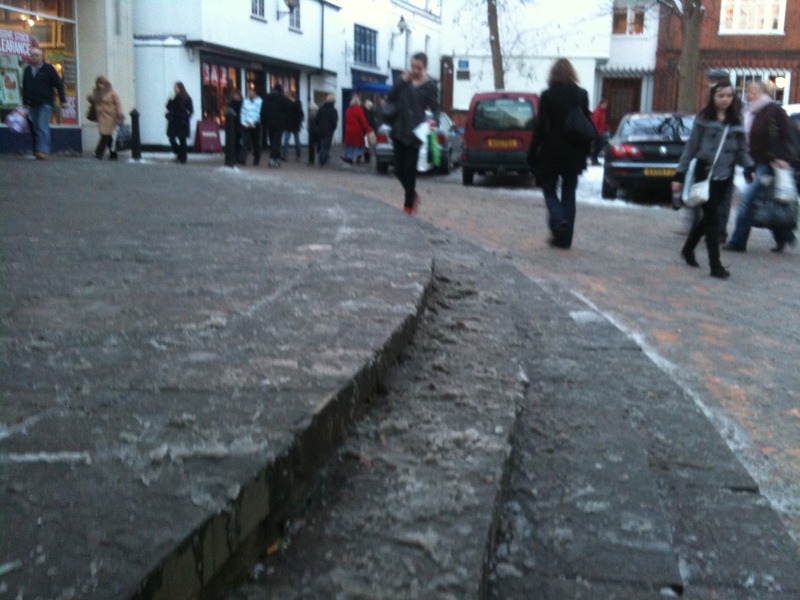 A set of stone steps outside the Buttermarket shopping centre were covered in snow. 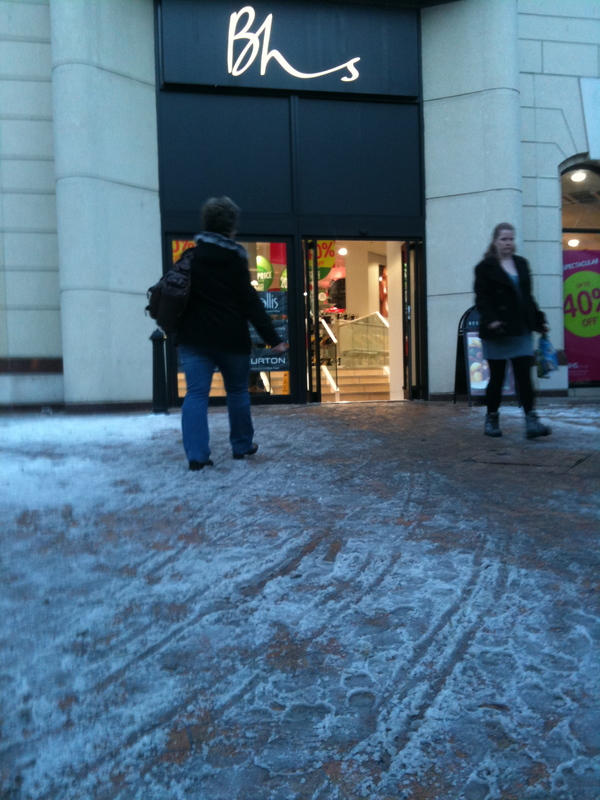 The manager said they had tried to clear it but had ‘failed’, remarkable given the normal fuss about ‘Elf and Safety’. He also said that they certainly wouldn’t clear anything that wasn’t owned by them because of the risk of getting sued, which just doesn’t happen. He didn’t think they could even make a donation to the boy scouts to do it for them. BHS didn’t seem to have done anything either. 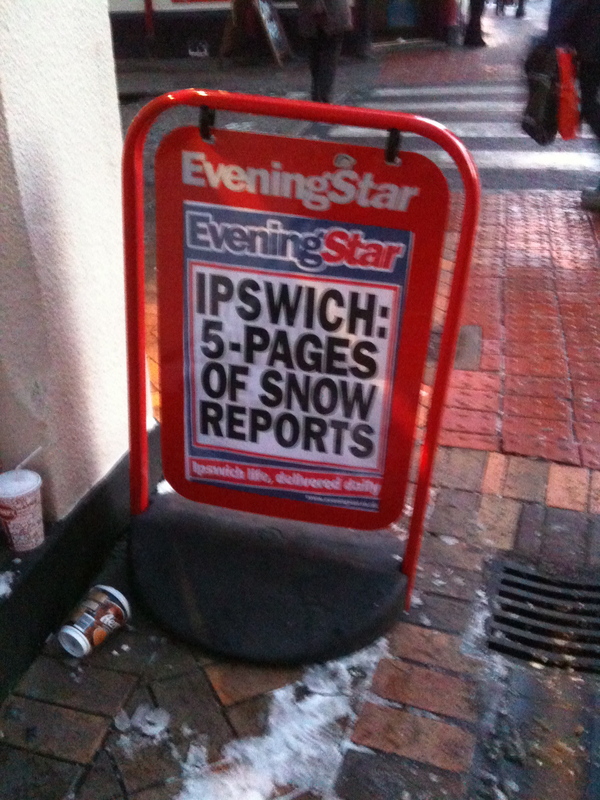 Meanwhile the BBC was reporting ‘Cold weather hits major retailers’ shares‘ and the Ipswich Evening Star was proudly advertising ‘5 pages of coverage of snow reports’. Is this Big Society or Little Britain. I will continue to encourage these people to wake up and sort things out for themselves rather than waiting for ‘nanny’ to do it for them. 5 pages of snow reports! Maps are simplifications of reality and by their very nature introduce bias based on what they include and what they leave out. Unfortunately most current maps have a bias towards the car given that they leave off most of the detail that matter only to pedestrians and to public transport users. This problem is compounded when the maps produced by authorities specifically for these user groups also leave of the relevant details. This problem was demonstrated very clearly to me today while we were delivering some xmas cards on foot today. 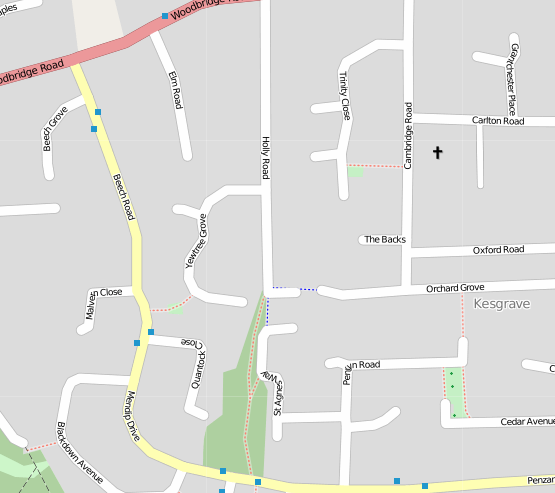 We delivered our first card half way down Beech Road and then needed to get to the southern end of Cambridge Road as shown on the following map from Google. This map has an amazing amount wrong and is almost completely useless for walking directions as you will see as the post develops. 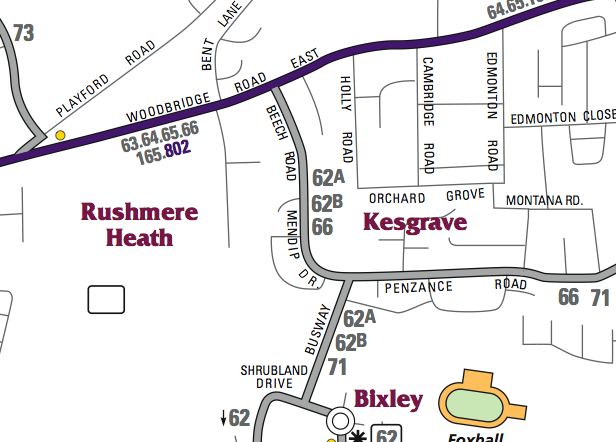 From this map it would seem sensible to head north then east along the busy Woodbridge Road and then all the way down Cambridge Road. 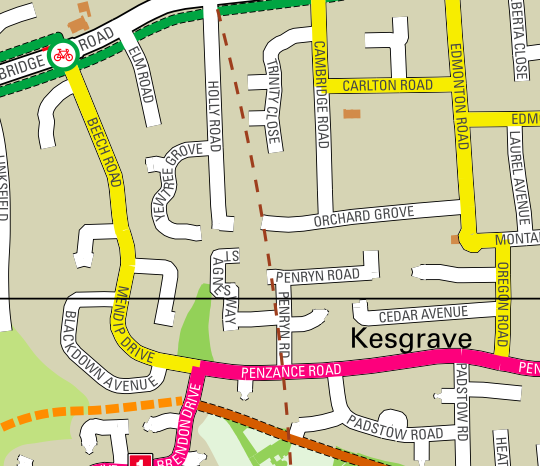 Actually, I knew that there was a convenient set of footpaths missing from this map so we set off south to pick up a footpath that went up through the woods from Mendip Drive and then east along a short path. The paths are shown on this map from OpenStreetMap. The small blue squares are bus stops btw. However, we then spotted a footpath I didn’t know about which seemed to be going in the right direction. We asked someone getting snow off their car if it would help, but he told us to go up to the main road as per the Google map. 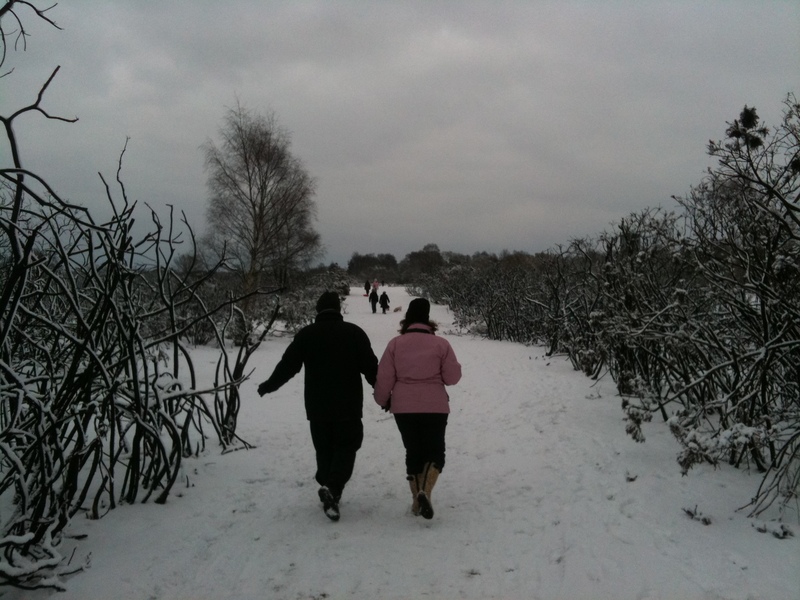 I knew that wasn’t right so we completed the trip as already planned going down to Mendip Drive. The clever bit about OpenStreetMap is the edit feature, so when I got home I pressed edit and added the missing path and the map now looks like this – notice the additional path. What is clear to me is that the guy cleaning was using a mental model based on the roads as supported by the Google mapping. It gets worse though.. There is also a mapping website called walkit.com which aims to address this limitation with other mapping and which, as you might have guessed, promotes walking. 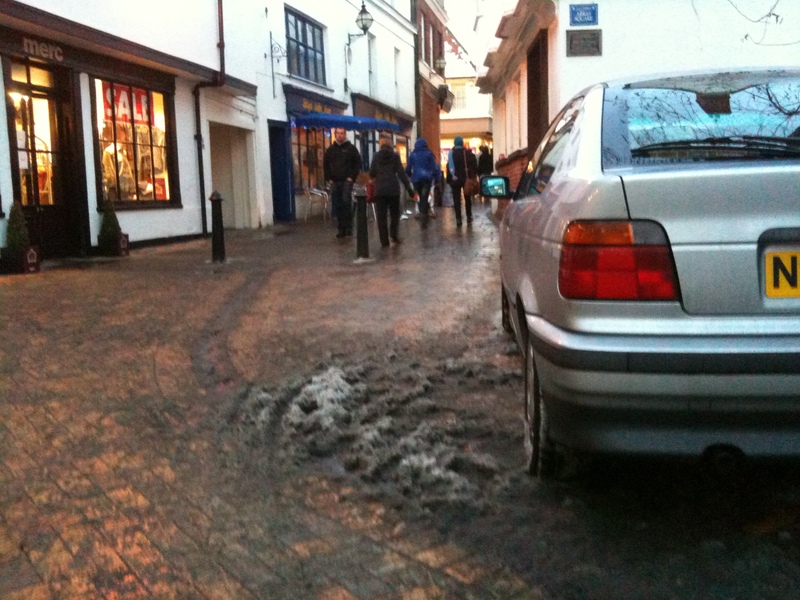 Unfortunately it doesn’t have these paths on either and recommends the route as Google and the car driver! 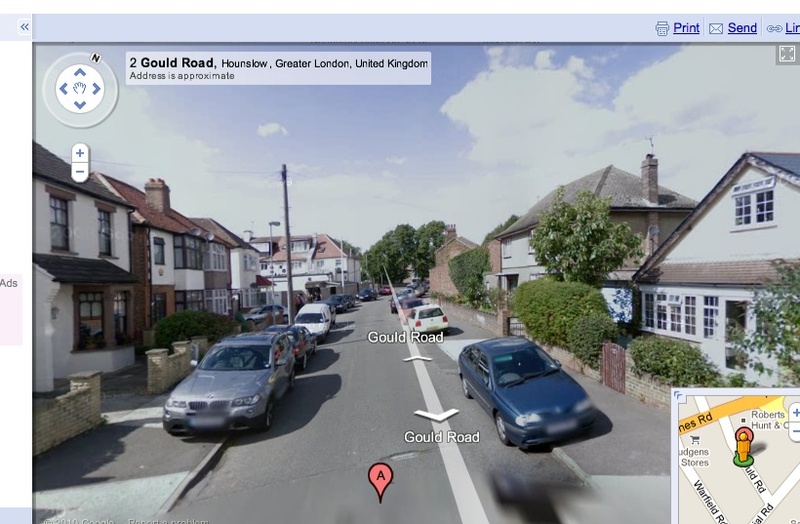 notice that there are no bus stops marked either. And then there is the local official cycle map published by Suffolk County Council which also misses the paths off! And now lets look at the local bus map which also misses all the footpaths and curiously doesn’t even show the positions of the bus stops which seem to be kinda important to public transport users. What is going on here? OpenStreetMap which is produced and maintained by volunteers like me is available for free and is very accurate.The official cycle map which is produced at significant expense by Suffolk County Council, the local instance of Walkit.com which was commissioned and paid for by Ipswich Borough Council and the local bus map which is produced by the local bus company all largely reinforce the car drivers view of the world by leaving off this critical detail! I will again recommend that that stop spending money on these resources and promote OpenStreetMap as Microsoft do with Bing Maps which can now display OpenStreetMap data. 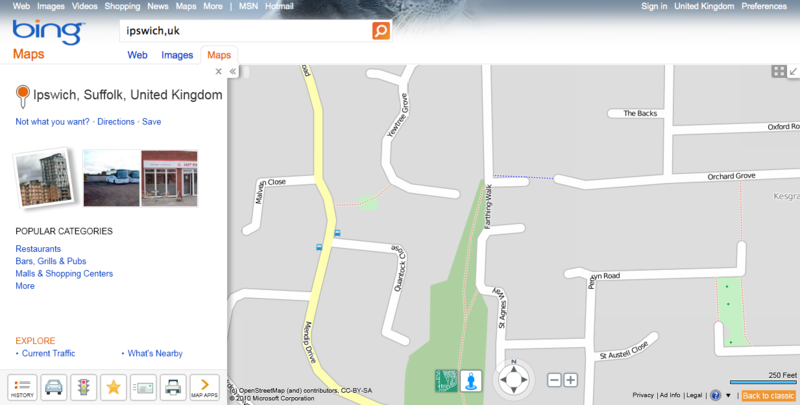 OpenStreetMap data can of course be used as the map base for all of the above specialist local maps if necessary.